Whatever your thoughts about statement sleeves, they are definitely trending. I must admit, I have had a hard time with this trend because my arms are big enough and the last thing I want is more material there to draw even more attention to them. Statement sleeves are something I love to see on everyone else, but me, not so much. But then I feel that way with just about every fashion trend. We are always our own worst critics. 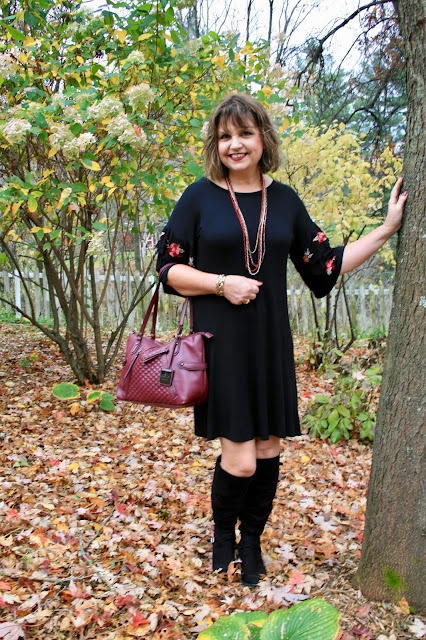 Nevertheless, with most trends, I eventually find a style I can work with and this pretty dress from Francesca's was my answer! The sleeves are on the loose side and the material is thin, so it doesn't add a lot of extra bulk to my arm. And isn't the embroidery on the sleeve just gorgeous? For jewelry, I chose a red and gold multi strand necklace to echo the colors in the embroidery on the sleeve. But I really didn't like the way the necklace looked with this dress. I think I tried just about every necklace in my collection with this dress, and I wasn't happy with any of them. I would love some some suggestions if anyone has any. I also wore a gold bracelet to coordinate with the gold in the necklace. 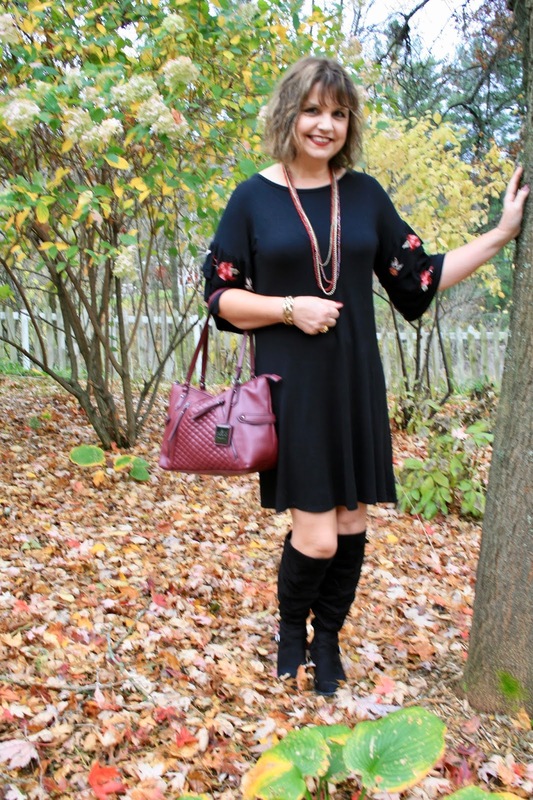 And I carried my usual burgundy handbag because it just seems to go with all my fall outfits. 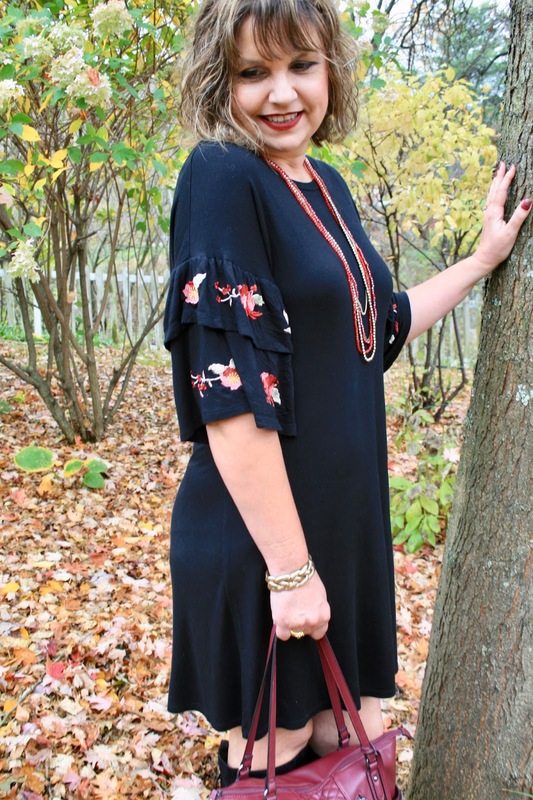 I bought this dress a couple of months ago when Francesca's had their amazing "$20.00 for anything in the store if purchased in increments of two" sale. I know, what a deal, eh? I signed up for their emails so if they ever have an amazing sale like this again, I'm ready! I wore my old Over-The-Knee Boots that I purchased last year from Famous Footwear. They are by Steve Madden. These boots have a shorter shaft, so if your still on the fence about this style of boot, this might be a good choice till you get more comfortable wearing OTK boots. However, be aware that the shorter the shaft, the more likely the boot is to slip down. The boots have a buckle in back and on the front. If you are in the market for an OTK boot look for boots that tie in back instead of a buckle. They tend to stay up better because you can tighten them as much as you need to. This dress has a very low back, which I am actually uncomfortable with. Hubby of course loves the open back. It also has a black strap going across the top of the back. You can kind of see it in the picture below. My hair is covering it a bit. I really like the looser fit of this dress. A lot of jersey knit dresses can be very clingy, which I don't like. It is a thin material, and although I bought it for fall/winter, I think it would work better in the spring/summer in my climate. I purchased a burgundy sweater vest after I took these photos and I'm anxious to try it with this dress. I think it will cover up the open back and make the dress a little warmer so I can wear it during the colder months of the year too. So what about you? Have you purchased anything with statement sleeves yet or are you still on the fence? I'd love to hear from you! Unfortunately, this dress is no longer available on-line but you might still be able to buy it in your local Francesca's store. I still saw it hanging on the rack in my local Francesca's last week. 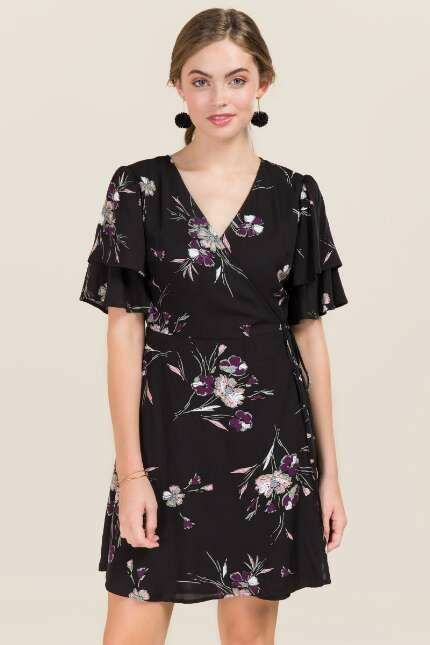 They also have lots of other fabulous dresses with statement sleeves on their website. Here are a few I have my eye on! This gorgeous teal dress I tried on in the store but I didn't buy it because it was really clingy on me. However, now I regret not trying it on in a larger size, because I really love it and maybe a larger size would not have been so clingy. Oh well, I'll keep an eye on it in case it ever goes on sale. I love this wrap dress. The pattern is perfect for fall and the sleeve detail is loose and thin so I think it would work for my body shape. I love this dress, but I decided to stop buying anything with cut-out shoulders because I don't think they are flattering on me. Another style that I love on everyone else but not on me! But isn't the color and print so pretty? 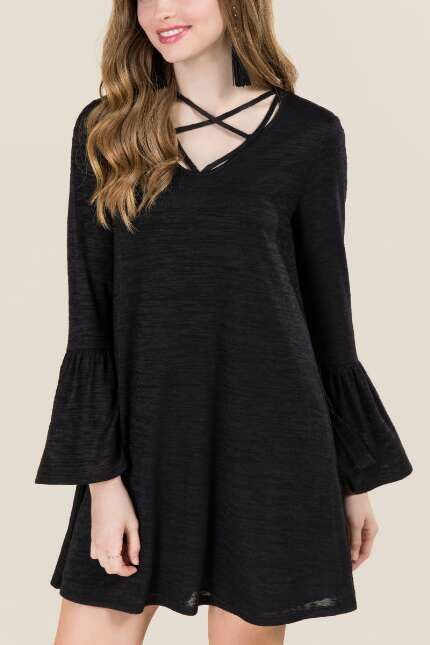 This cute LBD has two trends: criss-cross straps and statement sleeves! So pretty! A lot of Francesca dresses are on the short side. Keep in mind you can also wear them as long tunics if you think they are too short. 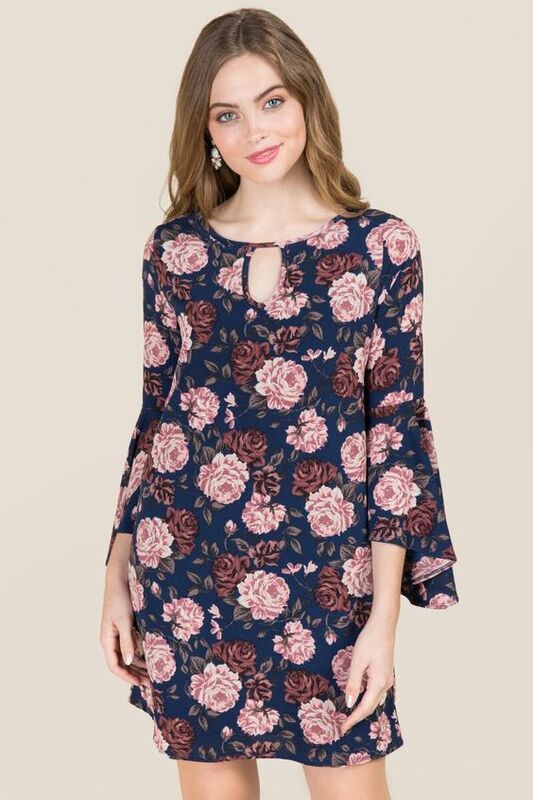 This pretty fall floral dress has a lovely bell sleeve with a keyhole opening at the chest. All these dresses can be found on the Francesca's Website! Which one is your favorite? P.S. If you haven't checked out my new Facebook Page, please do! I'd really appreciate it if you liked and followed too! Thanks Mica! Yes, the shorter sleeve definitely doesn't get in the way! So sorry about your sick kiddos! Glad everyone is feeling better. I love the statement sleeve trend, but you're right, the placement of the "statement" has to be strategic. Your dress is gorgeous and looks so comfortable! haha, yes, Stitch Fix can sometimes send some very unique pieces. Thanks so much! I do think it takes some time to get used to some of the newer styles, but yes---we are always our own worst critic. Hopefully I'm getting better about it, because it's such a waste!!! This dress is perfect on you Amy!!! Yup, I usually take a full season to get used to it and want to try it myself. Thanks so much! Fashion is such a fickly business. If you feel good in it then wear it. I like to cover my arms too, they just aren't my best attribute. Love your choices. Thank you! I agree! We all should all wear what we like! This dress is so pretty! Love those sleeves! 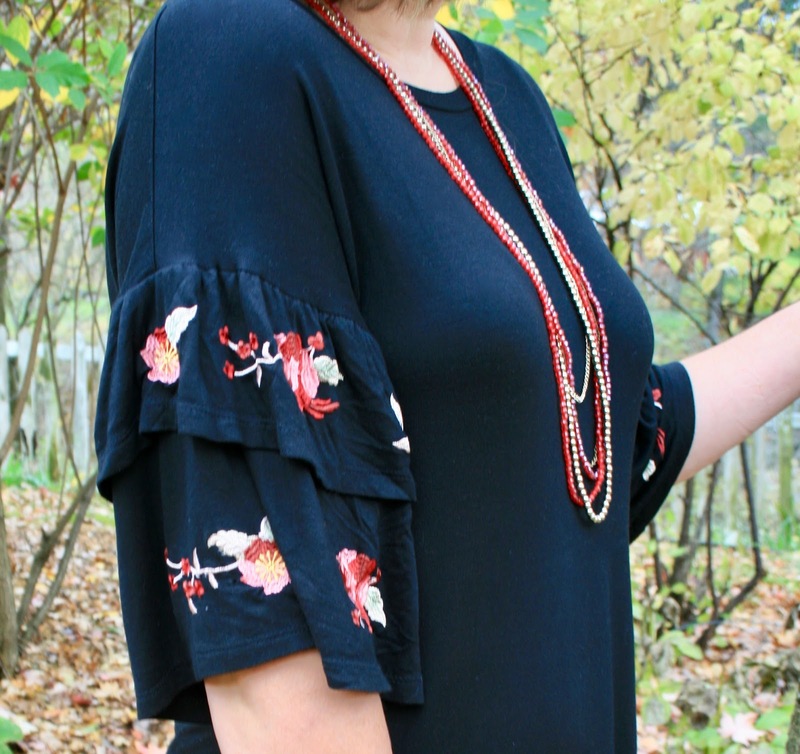 I haven't bought anything with statement sleeves recently, but I do have a velvet long -sleeve shirt with statement sleeves in my closet from years ago. One of those pieces I never could get rid of even though I've only worn it a few times. Might have to get it out and see if it still fits! Thanks Elli! Funny you should mention that, because it wasn't too long ago when all the big bell sleeves were in style (I think my daughter was in high school then, now she's 29). I got rid of all those tops, now I wish I would have kept them as they are all in style again! Love this dress and the statement sleeves are so chic! i styled a similar one recently and love it! Thank you! I'll have to check that out! Im such a sucker for embroidery! This dress is the cutest! I know, me too! I can't stop buying anything embroidered! Thanks so much! Amy I love this dress on you! The sleeves are so pretty and I just love the shape of the dress on you! Awww, thanks so much Ruth! Thank you! I'm still unsure about the necklace, so it's nice of you to mention it. I love that dress! It looks fabulous on you! I hope I can find a few tops with fun statement sleeves soon! Thanks Laura, there are lots out there, but it's hard to find the right ones! I haven't been to Francesca's in a while but they always have fun unique pieces like your dress. I agree, we are ourselves' worst critics but some bell sleeves are not so bad. And OMG, it is soooo hard to find jeans without holes these days. I found two pairs I liked that fit me great and I definitely bought them. Hope you had a great Halloween and Happy 1st Halloween to your grand-daughter. Stop by the blog to see the special Fall/Halloween post I put on. =) Thanks. Thanks Ada, yes, I love Francesca's for just that reason. I'll check out your Halloween post. Love this whole outfit, Amy, and your accessorising is spot on. But yes, what IS going on with all this sleeveage everywhere?!! Hugs, x. 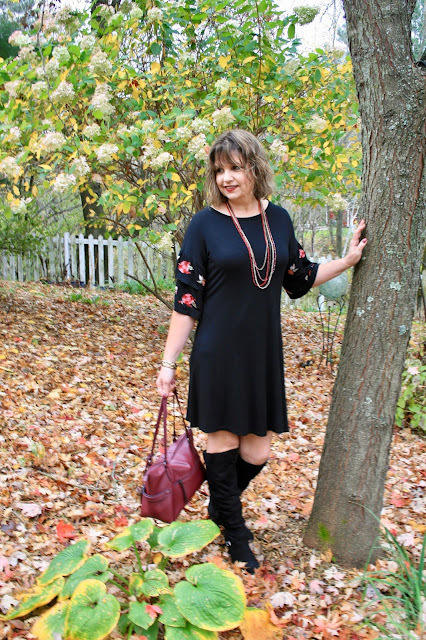 Love how you've styled the dress with boots and leg showing. I have a few statement sleeves but I'm not spending much as I'm conscious they will date in a year or two. Thanks Anna! I so agree! Like I said in my post, I went through this trend just a short while ago and got rid of everything, and now it's all back again. Guilty as charged with my love of statement sleeves ;) but I much prefer a traditional sleeve in the winter months when layering a coat is easy as compared with fighting to get one on over some of those dramatic sleeves out there right now. That said, I love this dress on you, Amy! It is so chic and fluid, and the sleeves, while making a statement are soft in the way they fall. That embroidery adds the perfect pop! Lovely! Thanks Mary! You do have a lot of statement sleeve garments, but your so thin, they all look great on you, whereas I have to really hunt for one that works. Love this outfit, Amy! Yes I do love the statement sleeves...to a point. I've bought several things and really like them but they are trendy and what do we do next year when that trend is over? I actually have wondered if the sleeves could be shortened to remove some of the statement. :) Can't get enough embroidery this year! Thanks Stacey! I know, it's hard to resist buying too much of a trend if you really like it, cause what do you do when the trend is over? Love the embroidery and the sleeves are so pretty on this dress. i noticed the same about the sleeves when i was in Target the other day. Thanks Jessica! Statement sleeves are certainly everywhere! Beautiful dress, it looks fab with the long boots! I love the embroidery on the sleeves and the low back, although I have to admit that I don't like wearing tops or dresses with a low back because I get a cold neck! They do look nice though. Thanks for linking up! Thanks for linking up to Top of the World Style. Your LBD is such a statement piece. 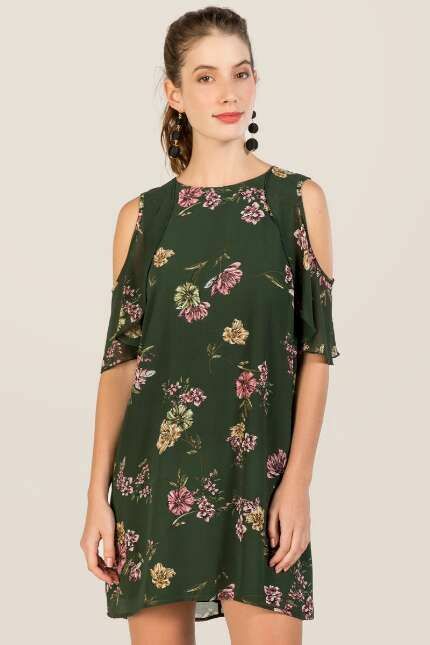 You look stunning and so cute in this embroidered statement sleeve dress. Great look on you!